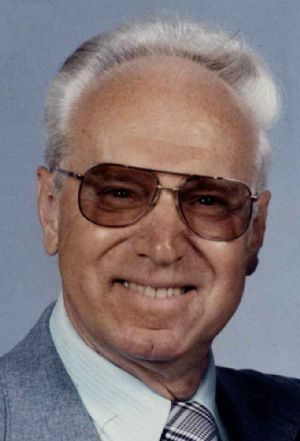 Milton “Milt” Wesley Miller, age 92, of Green Lake, WI, passed away on Thursday, February 7, 2019 at Patriot Place in Berlin, WI. His last breath was in the arms of those he brought into the world, his children. Milt was born August 25, 1926 in Ripon, WI to Otto Miller and Bertha (Duehring) Miller. He attended school in Ripon and married Ruth (Schultz) Miller on November 14, 1947 in Sheboygan, WI. Milt was employed in the Trucking Division of Badger Mining Corporation for over 30 years. Milt volunteered on the Green Lake/Brooklyn Fire Department. He was a member of Green Lake Lions Club and the Good Sam Club. Milt was a member of The Federated Church in Green Lake, WI. Milt enjoyed the outdoors, whether it was spending time in his front porch swing, relaxing by a campfire or visiting with friends in the Good Sam Club. He shared his love of the outdoors by taking his family camping in their youth. He and his wife Ruth traveled throughout the United States in their motorhome meeting many "friends" along the way. He enjoyed all hunting and fishing, but especially going moose hunting in Canada with his friends and enjoyed deer hunting for most of his life. He proudly served as a volunteer fireman for the Green Lake/Brooklyn fire department for over 4 decades. In his early years Milt was an over the road truck driver delivering Rippin Good Cookies to both coasts with his driving partner "Weasel". He was an extremely social person who could recall the details of trips from years ago, experiences from his youth and had a wealth of mechanical knowledge. He was an avid sports fan and enjoyed following his favorite teams. Milton is survived by his children, Joanne (Dan) Cooper of Wautoma, WI, Vicki Likwarz and Timothy (Pat) Miller, both of Ripon, WI, Susan (Peter) Mark of Flushing, NY, Kristine (Larry) Herrell of Green Lake, WI, Debra (Jerry) Fleiss of Germantown, WI; grandchildren, Todd (Doreen) Cooper, Shad (Jennifer) Cooper, Wesley (Kelli) Crook, Magan (Salman) Umar, AJ (Kathy) Krause, Patty (Rick) Garner, Benjamin (Holly) Miller, Julian Miller, Elizabeth Miller, Joshua (Patti) Herrell, Craig (Katie) Herrell, Lindsay Herrell, Kelly (Brian) Zirbes, Amanda (Ray) Reich; seventeen great-grandchildren; one great-great grandson; two sisters, Eileen Radke and Betty Lozano; and numerous nieces and nephews. He is preceded in death by his wife, Ruth Miller; son, Steve “Minnow” Miller; parents, Otto and Bertha Miller; brothers, Earl Miller, Gordon Miller and Donald Miller; Sister, Ethel Kohlemainen; sisters-in-law, Marge Miller, Norma Miller and Ruth Schultz; brothers-in-law, Jack Radke, Lorand Schultz, Victor Schultz and Fred Schultz, Jr.
A visitation for Milton will be held on Wednesday, February 13, 2019 from 9:00 – 11:00 am at The Federated Church of Green Lake, 489 Scott Street, Green Lake, WI, 54941. A memorial service for Milton will be held on Wednesday, February 13, 2019 at 11:00am at The Federated Church of Green Lake, with Reverend Karen Gygax Rodriguez officiating. Inurnment will take place at Garden of the Cross Cemetery, Ripon, at a later date. Memorials in his name may be directed to Green Lake/ Brooklyn Fire Department, 574 Commercial Ave., Green Lake, WI 54941.